An article by Janine Copple Comments Off on Trail Ramblings: What’s Closed And What’s Not. 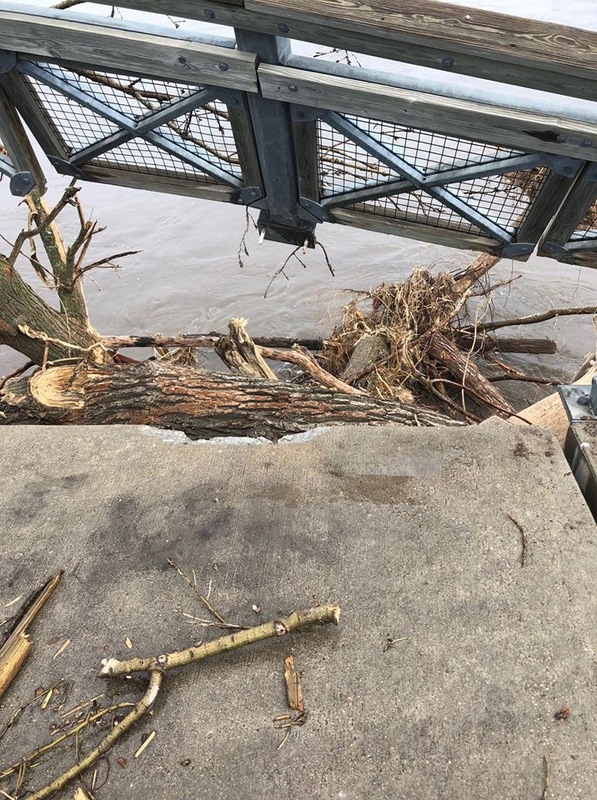 News and Photos have been trickling in over the past week or two of the damage to the mountain bike trails and trail bridges along the Platte. The word on the street, er bike shop, was that there is massive damage, missing trails and damaged park infrastructure. You’ve probably seen some of the pictures. Other parks and trails are fine, though, or the damage is limited. 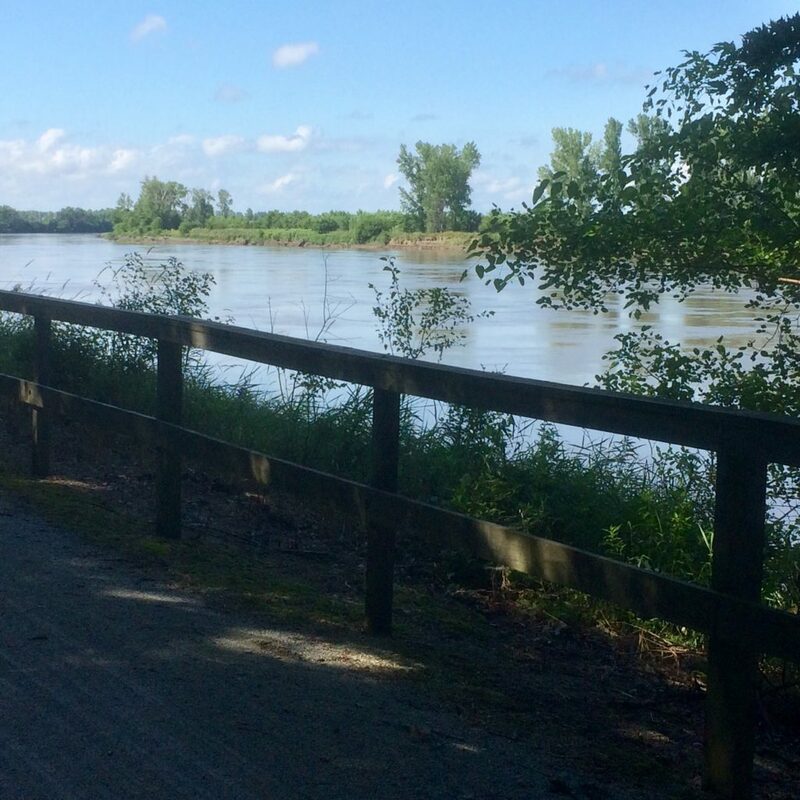 BikeWalk Nebraska has posted photos and video on their Facebook page of the Lied bridge over the Platte at South Bend on the Mopac, as has the Papio-MissouriRiver Natural Resources District. After the Missouri river levee at Peru failed, the Steamboat Trace was inundated and will be out of commission for quite a while. Along the Steamboat Trace in better days. Louisville SRA, Twin Rivers SRA, Schramm Park SRA are closed. Lewis and Clark is partially open and good to go. Bluestem and Stagecoach are open but accessible by an alternate route. The Ox bow trail system at Ashland was under water when the Salt Creek rose well above flood stage on March 13, so is a no-go. The following info is hearsay, but from a good source. Calvin Crest is open, but soft and the section along the river is gone. Platte River State Park is open, but the trails are boggy. Branched Oak area 7 is good. Wilderness park is likely to have muddy patches for a while yet. Some information on conditions may be found at https://www.mtbproject.com/ if you know which park you’re looking for, or THOR trails on Facebook has some updates on Tranquility, Swanson, Jewell, and Walnut Creek. Please stay off wet trails. On a more positive note, Schramm and Platte River State parks are receiving Nebraska Game and Parks Venture grants to upgrade and expand their mountain bike trails. Also, Swanson Bike Park in Bellevue will be getting a grant from the International Mountain Biking Association (IMBA) for a progressive mountain bike skills park to encourage youth mountain biking. The aim is to “get more kids learning outside and more families enjoying the outdoors”, and that is something to celebrate.